Kenneth Ma (馬國明) has been enjoying his time filming for TVB’s new Republican Era series, Lord of Shanghai <梟雄>. Collaborating with renowned film kings and TV kings, he is further brushing up on his own acting skills and gathering helpful advice. Veterans such as Anthony Wong (黃秋生), Kent Tong (湯鎮業), and Wayne Lai (黎耀祥) acted as Kenneth’s guides throughout the past few weeks. Kenneth expressed, “I share many scenes with Kent, and he is a brilliant actor. I could feel it as soon as he arrived on set. Although I don’t have any scenes with Anthony, I would still visit and watch him act.” He added that learning new acting methods is very beneficial, since viewers may feel his characters become too similar if he repeatedly uses his own style of acting. It has been more than ten years since Kenneth last collaborated with Wayne in TVB’s comedy series, The Driving Power <非常外父>. 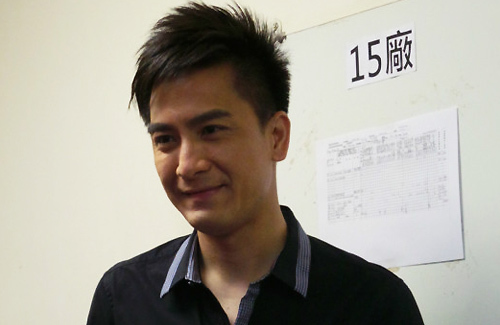 Kenneth expressed that he is glad to receive advice from the three-time TV King. “Wayne would suggest ways for me to improve when I work with him. I’m really happy to have all the veteran actors guide me through.” Hoping for more opportunities in his career, Kenneth remarked he is also ready to change his acting path at any time. He is not that terrible because 1 other guy trumped him in that dept. That being said, it is good he is listening and learning. Hopefully at some point suddenly it will work for him and suddenly find himself better at it. Good to know that Kenneth listens to learn more. He clearly lacks some refined acting skills, and his near winning of the best TV actor award is only due to idolism, not talent. He has some improvement to do in the acting dept, and more on his usually ‘sudden and continuous’ blur, surprised, pitiful, dazed and stunned look, all rolled into one facial expression. why dont you just go ad apply for tvb? Old is gold. He should seriously learn from veteran actors. Respect his humility though. I think his problem is his grin- it somehow makes him look silly. Other than that he’s almost perfect. Both of them are problem he almost makes that puppy eye look and his smile looks like a grind. Yup, he always makes those gooey puppy eyes. When he’s trying to act serious, he has a perpetually constipated look. When he tries to act fierce or evil, his range is limited to widening his eyes in a stare. In his latest drama, i see shades of Szema Shun from Three Kingdoms. He’s a one-note boring actor. Seriously why so many criticisms about Kenneth? He’s way better than Ron (who always portray the same characters). I’ll admit his acting isn’t amazing but can you do as well as him? Do you need to be a chicken to eat KFC? Do you need to be a chi-cken to eat KFC? Do you need to be a chi-c-ken to eat KFC? Kenneth has a gullible type of look.